It looks like Governor Cuomo's plan of painting targets on the backs of all teachers has not worked out as well as planned in NY State. Evidently there is a shortage, and to ease it, the geniuses in Albany are relaxing standards. Their thinking, evidently, is people from other states will be anxious for the chance to judged by Governor Cuomo's matrix, and potentially be guilty until proven innocent. After all, there aren't many opportunities like that in the United States. 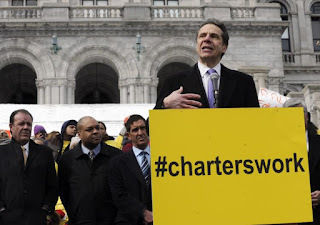 Another point of view, of course, is that Governor Cuomo is bought and paid for by Eva Moskowitz's BFFs at Families for Excellent Schools, and that he pretty much jumps at their beck and call. Maybe that's why he was so happy to appear at Ms. Moskowitz's field trip, you know, the one where she boarded all her students on buses and dragged them to Albany to lobby for her own political cause. If you or I did that, we'd be fired. But of course we didn't, so that's not why there's a teacher shortage. There's a teacher shortage because we're tired of being used as punching bags. We're tired of being vilified in the press, and by every tinhorn politician that takes suitcases of cash from DFER and FES. We're tired of hearing people like Cuomo enact rating plans to fire teachers, call them "baloney" when they fail to fire enough teachers, and revise them for the express purpose of firing more. We're tired of being judged by test scores which the American Statistical Association correctly asserts have little or no validity. We're tired of being told the only way to teach is like this, like that, or like whatever Bill Gates wakes up and decides children other than his own must be taught. We're tired of endless testing and being forced to teach nonsense that does not help our children. We're tired of underlying assumptions by people with no credentials or credibility that the children we serve lack "grit" and must be treated with "rigor." I'm particularly tired of so-called leaders who create problems and then try to solve them in ways that don't address the problems at all. When I started teaching, pay was particularly low. The city didn't bother addressing the huge disparity in pay between the city and surrounding suburbs. Instead, there were ads in the subways and on buses to try to attract teachers. There were intergalactic recruiting campaigns. It turned out, though, that people from other countries and universes just couldn't afford to live in NYC. And then, of course, there is the issue of quality. I was one of the people who saw a subway ad and took a teaching gig. I had no idea what I was doing. On my ninth day of teaching, my supervisor wrote me up and said I had no idea what I was doing. But I had told her I had no idea what I was doing when she hired me. To this day I wonder why she expected more. She wrote that I should try to be more "heuristic" when I taught. Naturally that cleared up everything for me. Doubtless with excellent advice like that every teacher will become instantly excellent, no matter how much they raise or lower the standards. Cuomo is an empty suit, with loyalty to no one but Cuomo. He just said he won't support his party in its effort to retake the State Senate. This is they guy Hillary's people have representing the DNC for New York. He has no moral center whatsoever, does whatever the people who pay him say, and happily supports whatever the privatizers tell him to. And, oh, if the people rise up and say screw your ridiculous tests, he can always make some empty gesture, like a partial moratorium, and say, "See? I care what you think, sort of." This is step one in addressing a teacher shortage created by Albany. There will be more. But until they start listening to teachers and learning why people no longer pursue this job, they will be empty gesture after empty gesture, likely helping no one but those who see education as an opportunity for profit.